Last year, against Cal, a team that gave up 48 points to USC, and 52 to Nevada, Oregon, who hadn’t been held under 40 all season scored a mere 15 points, and 8 of those came off of a punt return. It was one of the most painful victories you could possibly watch. To fall from such a high level of achievement so abruptly, ultimately lucking out on a stumbling kicker, and nearly end all dreams of a national championship, was literally painful. The California Golden Bears, a team that didn’t even make a bowl game, solved the nation’s best offense for 60 minutes. The question is, how? How could a defense, for 60 minutes, defend the entire field, not get beat by a deep pass, and hold LaMichael James, the most explosive running back in Oregon’s history, maybe even the conference’s history, Kenjon Barner, Darron Thomas, and Jeff Maehl for the entire game? It wasn’t faking injuries, or at least, not entirely about faking injuries. It was much, much more academic. 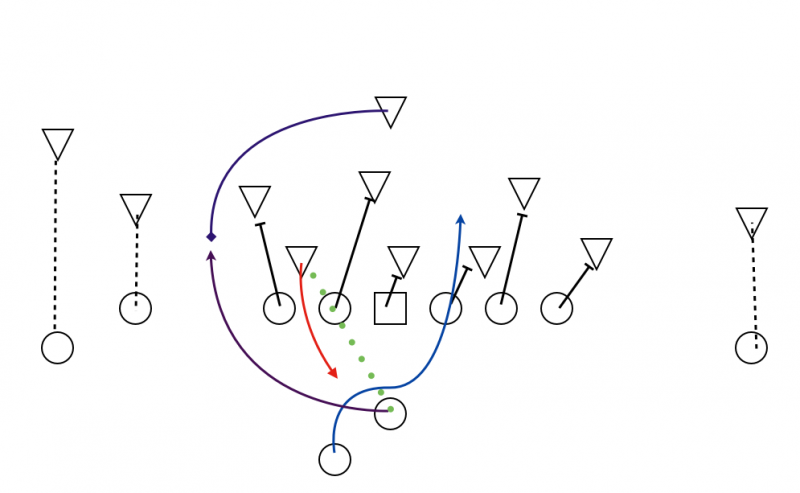 Here we have Oregon running an inside zone play, with a tight-end on the play side. Cal runs a similar defense to Oregon’s, at least they did against Oregon, and they put three down linemen and 4 linebackers/3 linebackers and a rover in the box. As opposed to a cover 2, or 3 look, where the safety(s) will cover a deep half or third of the field, Cal mans up everyone. Three corners on three receivers, the rover on the tight end , and the safety (which is the unique part) mans up the QB, in that the safety does not have deep zone responsibilities, but will “go-wherever the QB goes,” so to speak. So when the QB is being tracked by the safety, the linebackers and play side linemen have one job, to get LaMichael. Seems good enough, Oregon has an advantage right? 8 men (6 blockers, 2 potential runners) in the box to Cal’s 7, 6 with the read man. But Cal, unlike any other team to that point in the 2010 season, used the safety to “mirror the QB.” So Oregon’s key advantage, an extra play side blocker, is gone. Whenever a Cal defender was being read, he either found a way to either rush the mesh point, chip into a blocker, etc. or force Darron Thomas to keep the ball, and into the arms of the mirroring safety, or force the give and then run down the ballcarrier. The read-man had one goal: do something to remove that “hat-on-hat” advantage. It’s seven on seven, defense vs. offense. The only problem is, Oregon isn’t built to do that, their entire offense revolves on having that read man take himself out of the play. The 6/7 (however you want to look at it) remaining defenders had one purpose, and that was swallowing up LaMichael James. Between the inside zone, which was ineffective, and the outside zone, which was even more ineffective, Oregon was almost totally disarmed by this scheme, and couldn’t take advantage of its weaknesses (more on that later). Notice the Safety on every play, mirroring the QB, watch the defensive front crash the read side, and the read man doing whatever he can to disrupt the play’s flow. Oregon did try two new things against Cal, first of which being the implementation of the Pistol. They only ran one play out of the formation, and that was the speed option, which forced the linebackers to play sideline to sideline, as well as the safety to get downfield at the right angle to stop the QB. Wrinkles, wrinkles, wrinkles. This play has been in for a while, despite it not being properly recognized. If it’s not the veer, it certainly isn’t the inside zone, or at least it doesn’t look like it at all. In conclusion, Oregon had a really, really tough time last year against the Bears, not just because of the scheme, but because Oregon’s offensive line couldn’t block anything, Thomas had no rhythm, and whenever Oregon would start moving and getting momentum, Cal would do this. It was a tough, tough game, and the Ducks were lucky to emerge undefeated. Make sure you read some of CGB’s great breakdowns, especially Avi Kunnath’s huge breakdown of the first half. Very great stuff. Part 2 will introduce you to the 2011 Cal team, like always. Have a great BYE Week!